I have a fun project that can be used in so many different situations - get well gifts, teacher appreciation, candy container, goodies for the office, Christmas cookie exchanges, holiday fudge or peanut brittle, to say thank you, or just to say "I love you". 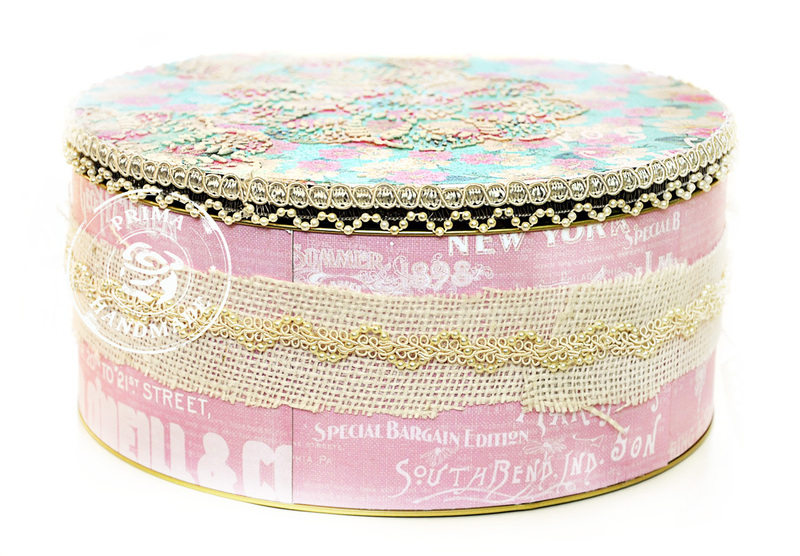 This all starts with a food tin and some pretty Prima papers and embellishments. Tins come in all sizes. My tin is 12in diameter - rather large. I am going to fill mine with chocolate chip cookies for a bake sale, so I went big. 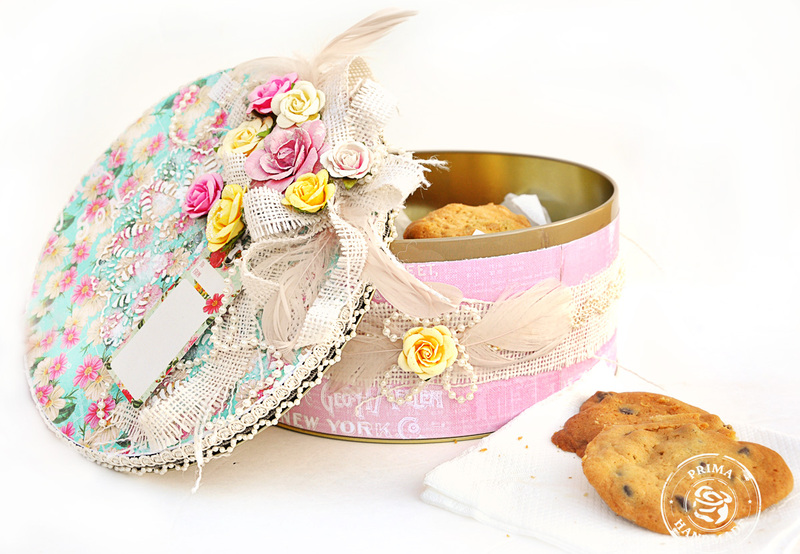 Because my tin was so large, I used more Prima product to embellish. Your project can be scaled down to be even more frugal. Now the choice of tins is important. 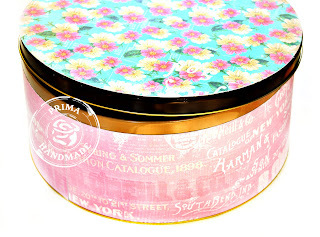 Feel the top and sides of the tin to make sure they are flat - no raised or stamped images on the tin or your beautiful Prima papers will not lie flat and you'll be having a big paper smackdown on them...you will not end up the winner of that battle. (sad face). Make your life easy - just make certain the tin is totally flat. ahhhhhhh simple. 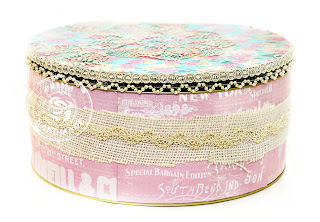 Best place to find an inexpensive tin? yard sales/garage sales, thrift stores and keep your eye out for clearance sales after any holiday. I bought my tin at an after Christmas clearance bin for 99cents. Step 1. I painted my tin with gesso to make the glue for the paper grip the tin better. Step 2. Cover top and sides with beautiful Prima paper. Important - you need to leave a little of the top edge of the tin uncovered. 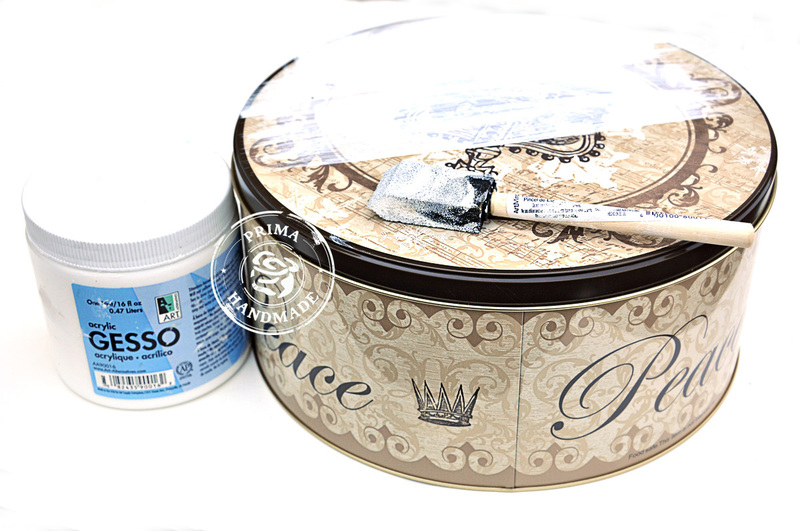 The tin lid will not close if you add paper to the entire side. In the photo below, you can see that I left about 1/4 inch of the side without paper. Step 3. 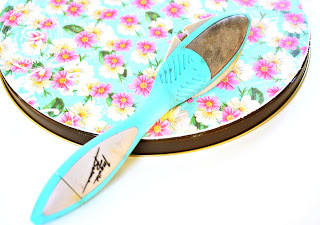 Use the Ingvild Bolme Distressing tool on the edges of the paper to give them a finished appearance, to sand off extra paper, and round the edges. Step 4. Apply a Prima stencil to the top with molding paste. It is fairly light in the photo but the texture when you are holding the lid and looking at it is a spectacular special touch. I used Elementals Stencil 960551. Step 5. Add some trim to the lid and to the sides. I used whatever trim was in my stash. I had some light colored burlap that I cut into a strip and glued to the side of the tin. I topped with more lace trim. I did not worry about neatly cutting the burlap - I think that is an impossible task if the edges start to fray. 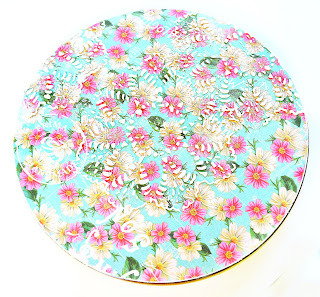 Instead, I decided that uneven, jagged and frayed edges added to my shabby chic elegance of the gift. Step 6. I had leftover burlap from the strip that I cut for Step 5. 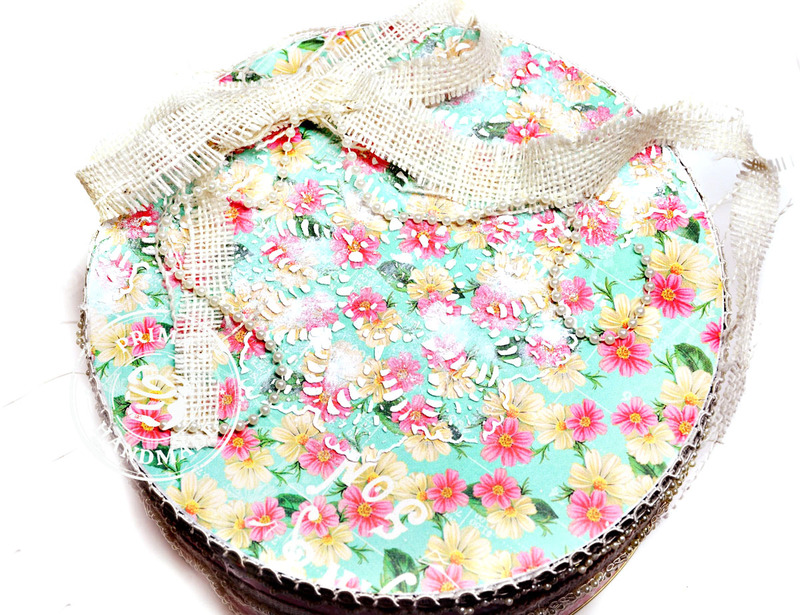 I thought that a loose, un-fussy bow from the leftover burlap would be nice. 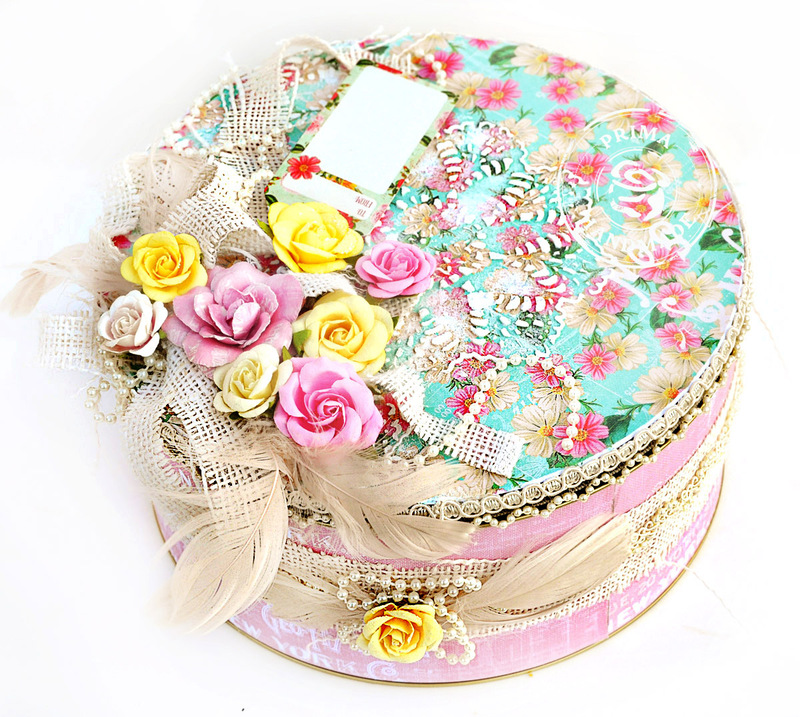 It would add interest to the top of the tin, add texture, be great filler with my floral cluster, save money by using less embellishments, and finally make the top and bottom of the tin a more harmonious and unified. Step 7. 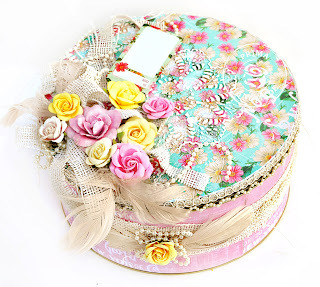 Finish with flowers, lace, pearl strands, gems, feathers, tags. Fill with just about anything and enjoy. You can make a tag from the leftover Prima paper if you are so inclined to save even more money. Total cost of Prima product for this project: $5.81. 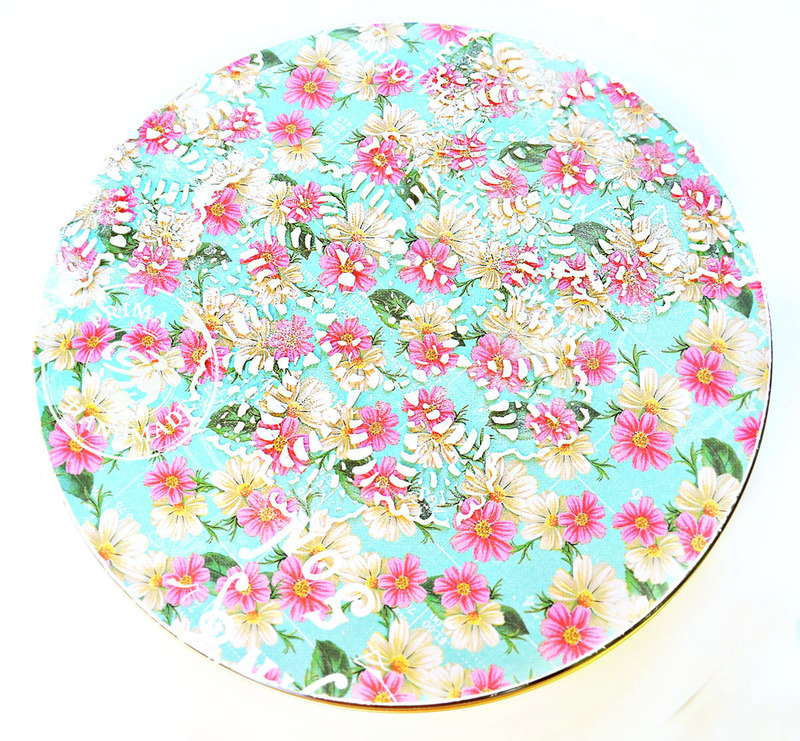 Keep in mind that I needed to use a lot of flowers since the tin was very large. 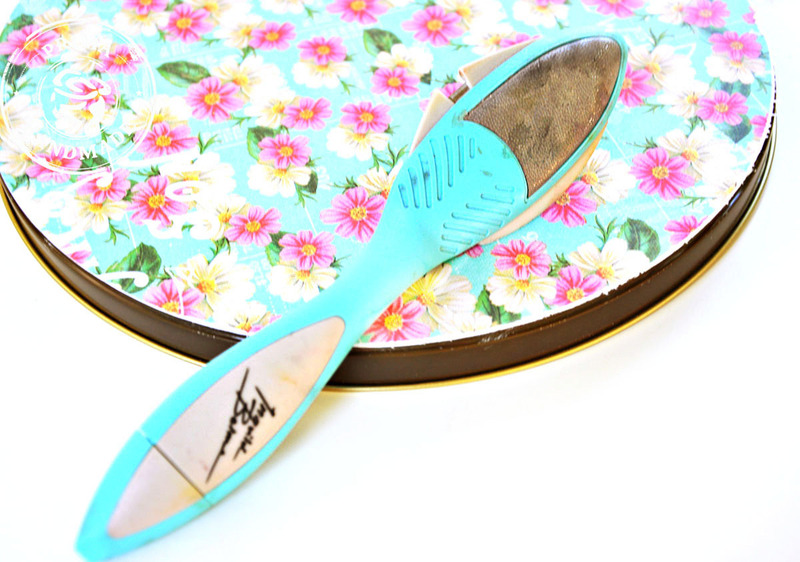 Your tin may be smaller, cutting down on the expense.